The town has an ancient heritage, and since medieval times has been prosperous. The name Saffron comes from the valuable Crocus sativus crop, which was cultivated here between the 15th and 18th centuries and was used as a dye, flavouring and medicine. The Woolcombers Hall survives from this period. The area is a good place for agriculture, and especially cereal crops, whether for raising sheep or brewing. Furthermore, the town has had a charmed past. It has never been industrialised nor been a military target, so much remains of times gone by. A decorative moulded plasterwork, known as pargetting, is typical of this part of the country and can be seen all over the town. The Old Sun Inn in Church Street is a particularly fine example and is also, tradition has it, where Oliver Cromwell and General Fairfax quartered when passing through the area during the Civil War. There are the ruins of a once large fortress, a C12th motte and bailey castle with a stone keep. Earl of Essex, Geoffrey de Mandeville, built this castle and others during the civil war between Stephen and Matilda. Henry II then ordered their destruction. The castle grounds were large enough to include the parish church and the market. 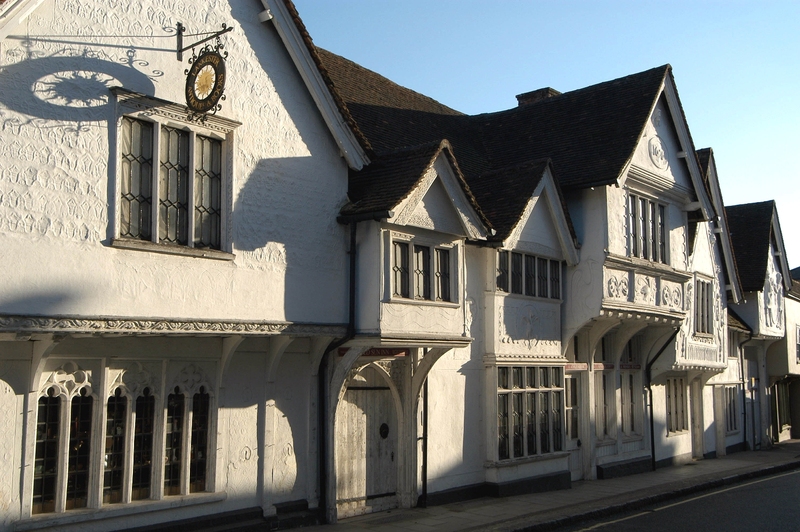 Close to the castle is Saffron Walden Museum, one of the oldest museums, it opened in 1835. Even the main car park, Swan Meadow, is a delight with its pond and ducks! In and around the Market Place, there are many independent shops and eating places to choose from. The twice-weekly market (Tues and Sat) has been held in the town since the C12th and has stalls selling a wide range of food and other goods. There are many small business premises in the Rows, which were the town’s shopping centre from medieval times onwards. The parish church , St Mary’s, is the largest in Essex and has the saffron crocus as its emblem; it tells the history of church buildings. The original church here may have been Saxon, which was replaced by a Norman church. That church was replaced by a Decorated church in the 1400s, and some parts of this survive. Later it gained Perpendicular nave and aisles. The Quaker family, the Gibsons who were successful business people, were benefactors of the town in the C19th. They built the Town Hall and museum and other public buildings. The family business was brewing, reflecting the suitability of local land for growing cereals. The museum later opened as The Fry Public Art Gallery which houses of C20th art. The town has an excellent Choral Society which dates from 1883. It has a reputation for high standard performance under the musical directorship of Janet Wheeler. Audley End House and Gardens is a Jacobean mansion with a range of fabulous gardens. It’s a beautiful country house which hosts seasonal events, such as wreath-making and carol concerts in winter. The mansion is managed by English Heritage is inviting and educational for all the family to visit. Bridge End Gardens is super for walking around the perfectly-manicured seven gardens and hedge maze. The common is also of interest as it played host to a Royal Tournament in 1252. Saffron Walden Horticultural Society was originally founded in 1819 by Lord Braybrooke and has continued on and off ever since. It holds three annual shows and has evening talks from October to April. The Society also organises coach outings to a variety of outstanding gardens. 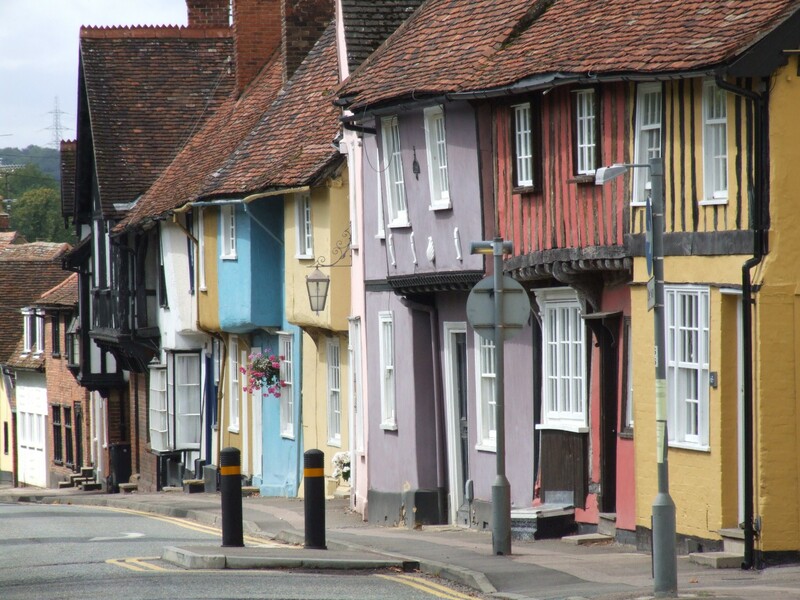 The town has good links to Cambridge and Stansted Airport. Visit Essex for more information. Previous PostWitney a beautiful ancient market town in the Oxfordshire Cotswolds.